I have a friend who is red-green colorblind. He can see most colors–in fact, he can see blue better than most people–but reds and greens? They’re all the same to him. I’ve realized recently that I’m walnut-pecan nutblind. A few weeks ago, a friend made a dessert, and I told her how much I liked the walnuts in it. She said there were no walnuts, just pecans. Then a few days ago I bought a nut mix containing what I thought were pecans. As it turns out, they’re actually walnuts. Okay, so I know these are different nuts. They’re clearly different shapes…but out of context, in a jar of mixed nuts, they look the same to me. They both have a similar shape and texture, and I’m pretty sure they taste similar too. Fortunately, walnut-pecan nutblindness isn’t something that impacts my daily life. I’ve managed to have a successful career in board game publishing despite this issue. It might be a problem if I were deathly allergic to one and not the other, but that’s not the case. I’m lucky. Do you have any food blindness? This entry was posted on Monday, December 11th, 2017 at 8:59 pm	and is filed under confessions and tagged with confessions. You can follow any responses to this entry through the RSS 2.0 feed. Many ‘greens’ look alike to me. Sometimes I confuse lettuce/cabbage and all the dark green veggies look alike to me. Also – Pumpkin Pie & Sweet Potato Pie I cannot tell apart. Daniel: Interesting! We all have our burdens to bear. DiGiorno & Delivery? I’ve heard this issue affects millions of Americans, however, so I don’t feel ashamed. On a slightly more serious note, I’ve lived with this one for a while…ham & ostrich. I simply can’t tell the difference between the two meats. How many times have you sat down what you thought was a plate of ham, only to learn that it was in fact ostrich? You’re not alone. I’ve heard of this. I think something like 1 in 300 million Americans suffer from ham & ostrich blindness, so you’re not alone. I think I must have two copies of a bitter gene—no kidding, such genes really exist, discovered in 2003—which means I taste bitter very readily and intensely. The bitter taste overwhelms whatever other taste a “bitter” food—e.g., coffee, dark chocolate—may have for non-bitter tasters. So, to me, they all taste the same (bad), and I avoid them. Very interesting. 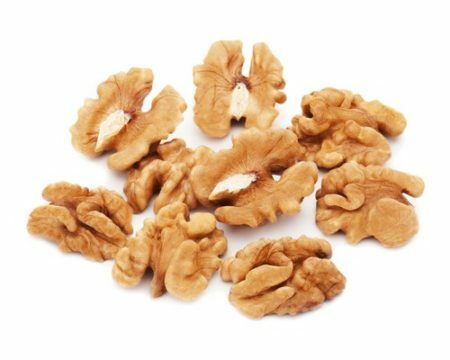 To me, walnuts are more bitter tasting, and pecans are sweet. I much prefer pecans. I think if you ate raw of each you could definitely tell the difference. I recently made a dessert that was supposed to have pecans in the topping, but I subbed in walnuts. My husband thought it tasted normal but it drove me crazy! I wonder if it’s a regional thing — I grew up in an area where pecans grow, and pecan pie remains one of my favorite desserts, when it’s done right. That’s really interesting–I would think walnut pie would be good too, but maybe it’s a little too bitter? This morning, while mixing up a gift batch of my trademark “blondies,” I ran out of walnuts before adding the “generous” portion of the “generous 1/2 cup” specified by the recipe. 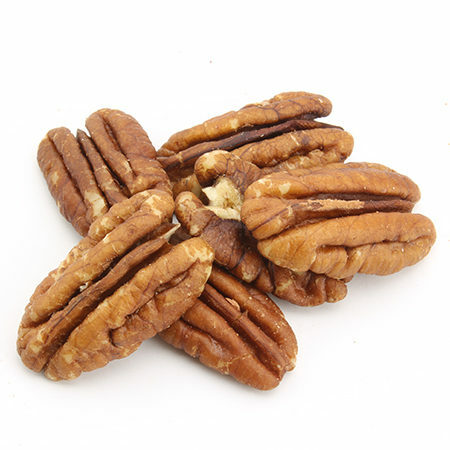 Filling in the missing portion with the pecans in my freezer would never have occurred to me had I not recently learned about walnut-pecan nutblindness. I’m eager to see if the recipient notices the substitution.